Despite its small size, the Vidin region is significant as the site of some important Roman settlements. Vestiges of fortresses in Ratsiaria (Archar), Bononia (Vidin City), and Casta Madres (Kula) are still around along with the old castle of Baba Vida, dating to the period of the Turkish invasion, and other medieval castles in nearby towns and villages. It has several natural features shared by many of Bulgaria’s regions: high mountains, beautiful beaches. Most of the region lies on the Danubian Plain and the Stara Planina, with its forest-covered slopes, lush meadows and the interesting rock formations known as the Belogradchik Rocks. Perhaps the most interesting archaeological artifacts are the cave paintings in the Magura Cave on the Serbian border that have been dated to about 10,000 BC. A lot of folk festivals are held in Vidin: dances along the Danube, meetings of traditional folk groups from other Balkan and Mediterranean countries, classical and folk music performances, and so on. One of Europe’s biggest infrastructure projects is also happening in Vidin: the construction of a bridge over the Danube that will connect Vidin City with the city of Calafat in Romania. Vidin shares a duty-free border with another Bulgarian neighbour, Serbia. 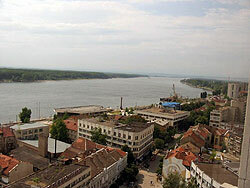 The city of Vidin sits by the Danube. Across the river is Romania. In 2007, construction began to build the second bridge over the river to connect the two countries—Vidin with the Romanian city of Calafat. It is scheduled to be completed in 2010. People going for a sail on the Danube can set out from the busy harbour in downtown Vidin. The city has a wealth of old sites, from the 9th century Baba Vida castle, the mosque and library of an 18th century ruler, Osman Nuri Pasha. People love going to the oak-filled Bojuritsa Park and fish and swim in the park’s lake. Going fishing on the Danube is a popular pastime in the small, picturesque village of Tsar Simeonovo. Not far from the village are several narrow river islands with sandy beaches where residents love to swim and sunbathe as well (though the longest river island facing it is actually just inside Romania). There is a resort complex on the waterfront with dozens of furnished apartments, studio suites and one- and two-bedroom flats.